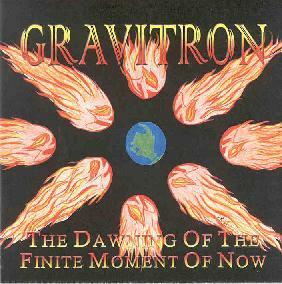 Gravitron - "The Dawning Of The Finite Moment Of Now"
The Gravitron story says that the band was formed as a direct result of seeing the Immortal Lee County Killers/Nebula and the Glasspack show in Chicago in November 2001. The band quotes a creative process inspired by the German Artist Collective, Die Brücke. The philosophy is to capture the purity and essence of the moment, thus all compositions here were written, arranged and recorded in a few hours. Quite good raw recording for 8 track. The band is Dave on drums and vocals, Kevin on guitars and vocals, Ryan on bass and some guests on keyboards. The CD starts with the "Finite Moment Of Now", a space instrumental piece before the heavy sludge hits with "Stone Fox". "Going Nowhere" is a Cheap Trick like tribute song. I wonder if the band saw their classic string of 4 shows at the Metro in 1998, where they played their first 4 records in their entirety plus some extra numbers each night! I have the recordings of these great shows. Anyway, this song is a weird one as most of the material is quite heavy, groovy, doomy, psychy stuff. "Slider" is cool psychedelic monster of a song. "The Meatman Cometh" and "Old Fashion Duel In The Modern Age" reminds me of the Melvins. The CD ends with two instrumental numbers, the first inspired by Paul Chain maybe. A cool wah guitar. "Pour It In My Hands (For A Dime)" closes the CD. If there is a weak point in this music project it is the vocals. Neither Keith nor Dave are very good vocalists, but don’t let that bother you as the music is quite cool and there is not that much singing! The artwork was done by Dirty from the Glasspack himself. You can buy the music from their web site. For more information you can visit the Gravitron web site at: http://www.feelgravitron.com. The Dawning Of The Finite Moment Of Now is distributed by Four Walls Records. You can visit their web site at: http://www.4wallsrecords.com. Contact via snail amil c/o Kevin Kapala; 726 S. Wisconsin Ave; Villa Park, IL 60181.